These logo T Shirts are an Excel Sportswear product. The shirts are 100% cotton and preshrunk. The colors remain crisp and vibrant. 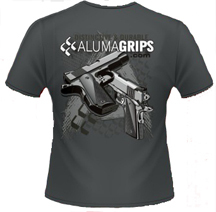 These screws will only work on the Desert Eagle grips that AlumaGrips manufactures. 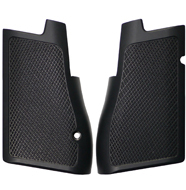 They are sold in sets of two even though only 1 screw is necessary to secure a set of grips. 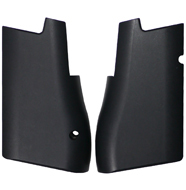 If you are purchasing the Desert Eagle grips at this time there is 1 screw inclued with the new grips. 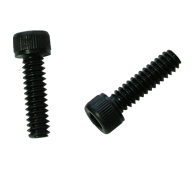 This Loctite is designed to be used specifically on screws under 1/4" diameter where repeated installation is an option. 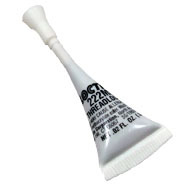 Loctite 222 should only be used on grip screws to keep them from " shooting loose". This is not designed to be used on the bushings. There is enough loctite in this reusable dispenser to secure approximately 8 screws. The Frame Saver is a product AlumaGrips developed that will keep the finish on your frame in good condition no matter what type of grips you use. The EMP Size Frame Saver will fit only EMP size frames with or without the ambi safety. 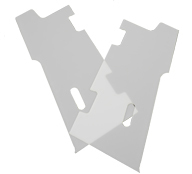 Frams Savers are only .005" thick and made of a durable and solvent resistant type material.